Over the last twenty years there has been a dramatic upsurge in the application of meta-analysis to medical research. This has mainly been due to greater emphasis on evidence-based medicine and the need for reliable summaries of the vast and expanding volume of clinical research. At the same time there have been great strides in the development and refinement of the associated statistical methodology. 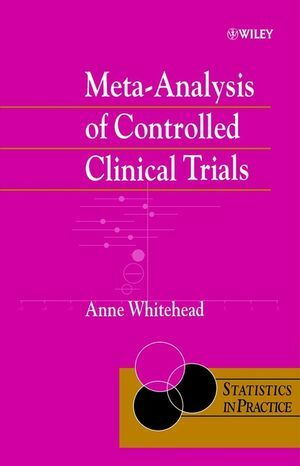 This book describes the planning, conduct and reporting of a meta-analysis as applied to a series of randomized controlled clinical trials. The various approaches are presented within a general unified framework. Meta-analysis techniques are described in detail, from their theoretical development through to practical implementation. Each topic discussed is supported by detailed worked examples. A comparison of fixed and random effects approaches is included, as well as a discussion of Bayesian methods and cumulative meta-analysis. Fully documented programs using standard statistical procedures in SAS are available on the Web. Ideally suited for practising statisticians and statistically-minded medical professionals, the book will also be of use to graduate students of medical statistics. The book is a self-contained and comprehensive account of the subject and an essential purchase for anyone involved in clinical trials. Anne Whitehead is Senior Lecturer in Modern and Contemporary Literature at Newcastle University, UK. She is the author of many books.